On August 24, 2012, a laid-off clothing designer reportedly shot and killed an executive of his former employer just outside the Empire State Building in New York City. These men had a history. According to news reports, they had filed complaints against each other more than a year earlier following an altercation. The alleged gunman periodically returned to his former employer’s premises after his discharge. Some reports state that his visits were for the purpose of collecting insurance benefits, while others state that the visits resulted in confrontations between the alleged gunman and the victim. In any event, the shooting could just as easily have occurred inside the workplace as at the building entrance. And no employer wants to find itself unprepared and facing a similar situation. So what can you do? And not just because the Presidential Election is coming up in a few months. 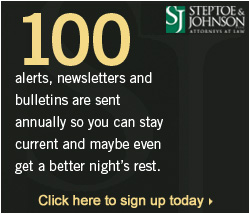 Every year, the American Bar Association posts a list of its top 100 legal blawgs. It’s sort of a who’s who list of law blogs prepared by the legal profession’s pre-eminent organization each year. If you enjoy reading our content and don’t mind spreading the good word about our site and features, please don’t just tell your colleagues about it. Take a minute or two to nominate us prior to September 7 for the ABA’s list! Just click on this link and scroll down to the part where you are asked to submit just a few basic items of information, including your name, e-mail address, the link to our blog, and why you like it from a legal perspective. That’s it. Certainly simpler than dealing with a lot of the workplace issues we talk about here regularly! We appreciate each and every one of our readers, thank you for visiting here often, and hope you continue to do so in the future. With the wars in Iraq and Afghanistan winding down, and more and more wounded veterans of those conflicts returning to the workforce, employers would be well advised to familiarize themselves with their responsibilities to disabled veterans. While most employers are familiar with the requirements of the Americans with Disabilities Act (ADA), you should also be aware of the similar, but sometimes more stringent, provisions of the Uniformed Services Employment and Reemployment Rights Act (USERRA). Although both acts impose requirements on employers to accommodate those with disabilities, there are a few differences. Judging from statistics, you have a greater chance of being sued right now for a wage and hour violation than for any other employment-related issue. Lawsuits filed under the Fair Labor Standards Act, the federal law that governs wage and hour, have risen by about 15 percent a year over the last several years. Collective action lawsuits under FLSA, which are claims brought on behalf of a group of claimants, now outnumber all other employment-related class actions combined. So, my editor sent me a link to an article about how employees can deal with horrible bosses. Turns out, there are loads of articles on this topic. Well, I wanted to approach it from a different angle: what can an employer do to make sure it’s not employing horrible bosses? You can’t kill them, like in the movie of the same name. Plus, you may just be trading your Kevin Spacey for a Bob Newhart (you’ll just have to check out the film to understand that one). Naturally, the guidance on the web for this question is a lot more sparse. It primarily focuses on who makes better bosses. Women? You bet we do. Men? Absolutely. Aliens? Even they have potential. But then I found it . . . robots. Clem Chambers is the CEO who runs the financial Web site ADVFN. He described his experience running his business as a robotic avatar in his article “How Robots Make CEOs Better Bosses.” The link is here. As he described zooming around his offices in various countries at a whopping 1 mile per hour as a four foot high “Clembot”, I realized that life as a robot boss had lessons which could be applied in any workplace. Be approachable. Robots come in all shapes and sizes, just like managers. In my view, working through intimidation ultimately drives off good employees, lowers morale and productivity, and is simply bad business. If you have a manager like this, you’ll see it reflected in the numbers. Talk to your managers – be sure you are approachable too. It may be that too much pressure or not enough guidance is coming from the top down, making your manager act like the Terminator. Or maybe your manager simply doesn’t know how to communicate with his employees. Set a good example yourself, then get that individual the training he or she needs to run your business or division like a cuddly R2D2. Be present. One benefit Chambers noted about his robotic avatar was that, while you can press the ignore button on your cell phone or monitor your caller ID, you can’t ignore a small robot bumping into your desk for attention. Face-to-face (or to-monitor in the case of our robotic friends) is almost always a more effective way to manage. Do your managers walk the floor? Do they keep up to speed on the changes in how things are done in the ranks? Horrible bosses may act as they do because they do not understand why employees work the way they do. The manager who is present can ask questions, have procedures demonstrated, and become a better manager for it. Encourage this in your workforce. Be chatty. On the TV show The Big Bang Theory, in an episode entitled “The Cruciferous Vegetable Amplification,” one of the characters, Sheldon, creates a mobile virtual presence device so that he can preserve his body until the singularity (the time when man’s consciousness can be fused with a machine). One side effect of his creation is that his ability to interact with others actually enhances – which for Sheldon is a pretty big deal. Not only can Shelbot share meals with his co-workers and friends, he can research and display the results on his monitor, play video feeds, and access documents to be shared. This may be a bit more than the Clembot can do, given the difference between TV and real life. But, are they truly that far apart? The point is that better communication equals better bosses. When expectations are communicated, employees and managers perform better. Communication grows trust. Teach your managers that it’s okay – and dare I say, beneficial – to share information. The beauty of living in a technological world is that we continue to learn and grow. Plus, robots are fun and exciting! If you think about it, managing like a robot boss would mean we’d always have to abide by the open door policy – because robots don’t have hands. That’s never a bad start.